This Aspatore legal title provides perspective on counseling homeowners and potential buyers through the challenges of the housing market. 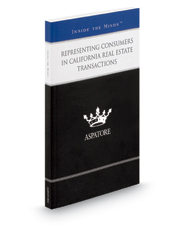 Experienced partners from law firms in California guide the reader through the process of learning about new real estate laws and utilizing this knowledge to better educate clients throughout the transactional process. These top lawyers offer advice on understanding the national and statewide regulations that buyers, sellers, and their attorneys face, handling loan modifications, and developing effective litigation strategies.